This is a sponsored conversation written by me on behalf of Glutino® and Udis®. The opinions and text are all mine. Uhhhh… anyone else wondering how in the heck it’s already the middle of October? Like where did the year go? How is it already time to start thinking about the holidays? Time, slow down – please and thanks. This will be our first year living in our new place and I am already thinking about Christmas festivities. Decorating and cooking and Elvis music and CANDY. Every year, my grandma sets out a HUGE spread of homemade candy. Along with baking sugar cookies with my other grandma, that candy plate is one of the distinct things that defines Christmas for me. Soft and chewy caramels. Crunchy hunks of toffee. Fluffy clouds of white and pink divinity. And most importantly, BUCKEYES. Buckeyes have always been my favorite holiday candy. Sweet and salty. 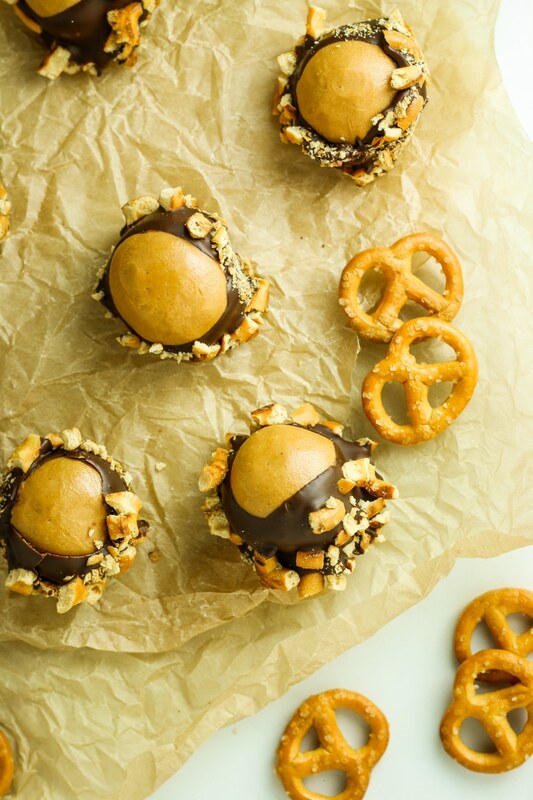 Covered in chocolate and stuffed with peanut butter. Adorably bite-sized. I mean, come on. THE best, right? Unless… Unless maybe, just maybe they could be improved somehow?  You see where this is going. There’s a party in chocolate-town and everybody’s invited! 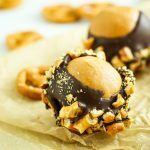 These Peanut Butter Pretzel Buckeyes are the kind of treat that makes life better for everyone because everyone can enjoy them. They’re completely gluten-free and can easily be made vegan with dairy free chocolate chips. They’re naturally sweetened – not loaded up with all of that icky powdered sugar. 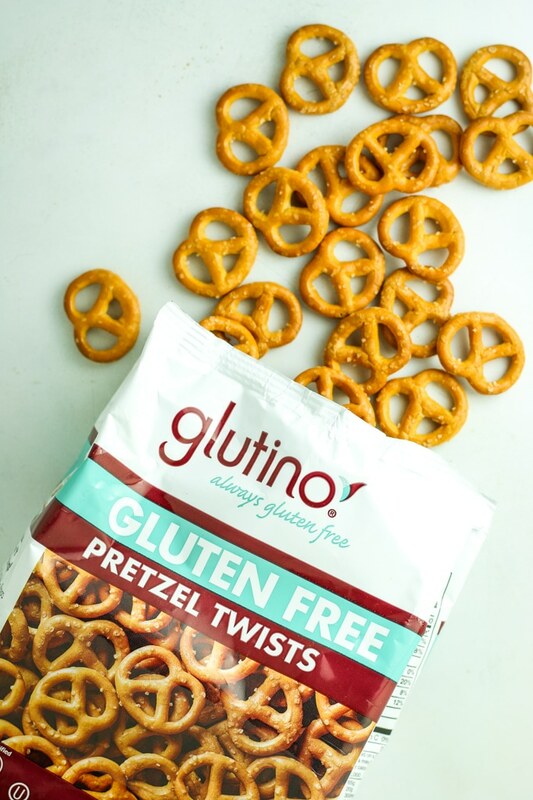 And they have a sweet and salty crunch on the outside thanks to Glutino Pretzel Twists. Food has the power to bring us all together. NO ONE should have to feel left out. Especially during the holidays. Glutino and Udi’s products make gluten-free living SO much simpler. I think that’s something we could all use around the holidays. It’s not always easy to stick to a gluten-free lifestyle when everyone around you is enjoying the full spread – that’s why a dessert like this is so good to have in your arsenal. 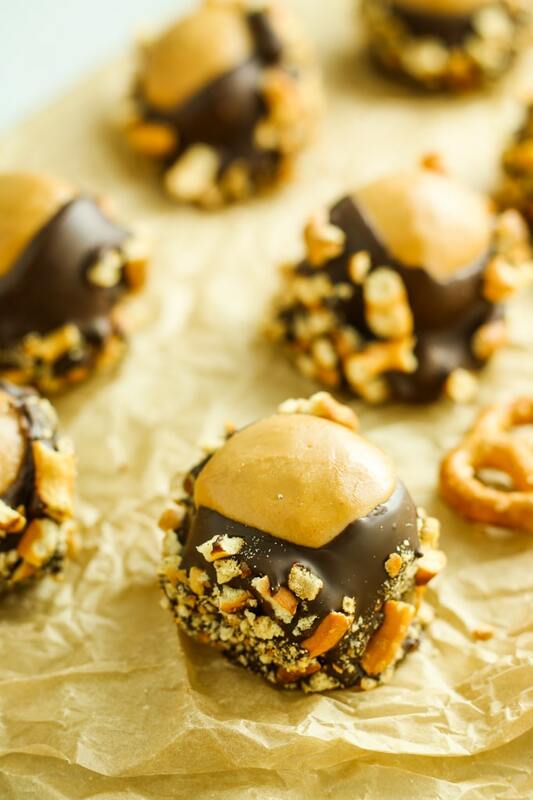 You can make these gluten free Peanut Butter Pretzel Buckeyes as an after dinner treat. Or use Udi’s White Sandwich Bread, which is perfectly fluffy, to make a French toast casserole for overnight guests. You can crush up Glutino Vanilla Creme Sandwich Cookies for a dirt pudding. And you should most definitely keep an Udi’s Three Cheese Pizza (or three) in the freezer for those late night family card games. I picked up everything for this recipe, plus the other products I mentioned above, right around the corner at my beloved Safeway – and I used this coupon for a dollar off, too! Check in the specialty snack section for the pretzels and cookies, and the frozen food section for bread and pizza. This is a sponsored conversation written by me on behalf of Glutino® and Udi’s®. The opinions and text are all mine. 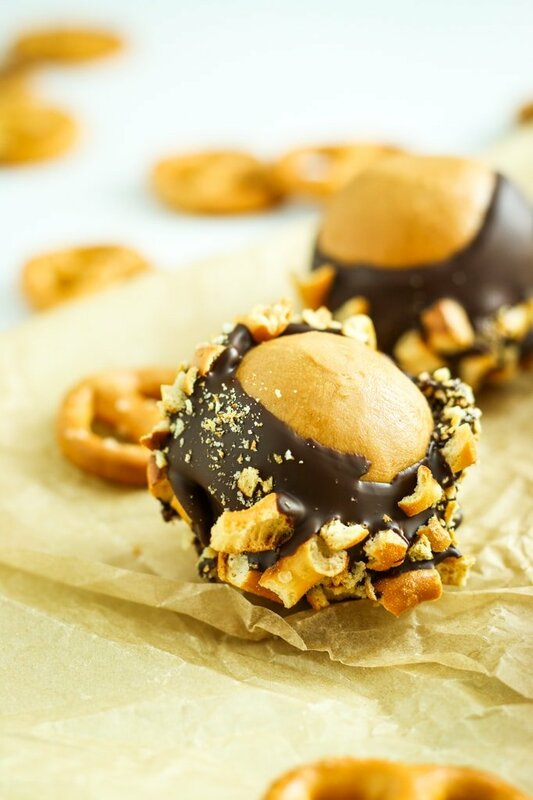 These peanut butter pretzel buckeyes are naturally sweetened and gluten-free. The perfect dessert for everyone to enjoy! In a medium bowl, combine peanut butter, powdered peanut butter, and maple syrup. Mix until smooth. Set bowl in the freezer for 15 minutes. Line a baking sheet or plate with wax paper. Remove bowl from the freezer and portion out the mixture with a small cookie dough scoop or spoon, about 1 tablespoon at a time. Use your hands to roll the scoops into balls and place on the wax paper-lined baking sheet. Once finished, place the baking sheet into the freezer. Crush the pretzels – I poured them into a plastic bag and used a can for smash them up. Don’t crush them to the point where they become a powder, just enough to break them up a bit. Pour the crushed pretzels into a bowl. Remove the balls from the freezer and dip them in chocolate, leaving just the top exposed. Quickly dip them into the pretzels and place back onto the baking sheet. Store in the refrigerator until you’re ready to enjoy! These turned out great! I adapted them to reduce the sugar even further by using Truvia nectar and sugar free chocolate chips. My diabetic fiancee’ was very happy to be able to have buckeyes again and he loves the glutino pretzels already, so this makes a great combo. Glad you liked the buckeyes! And thank you for letting me know that truvia works instead – I love to know about substitutes!